KANSAS CITY, Mo. 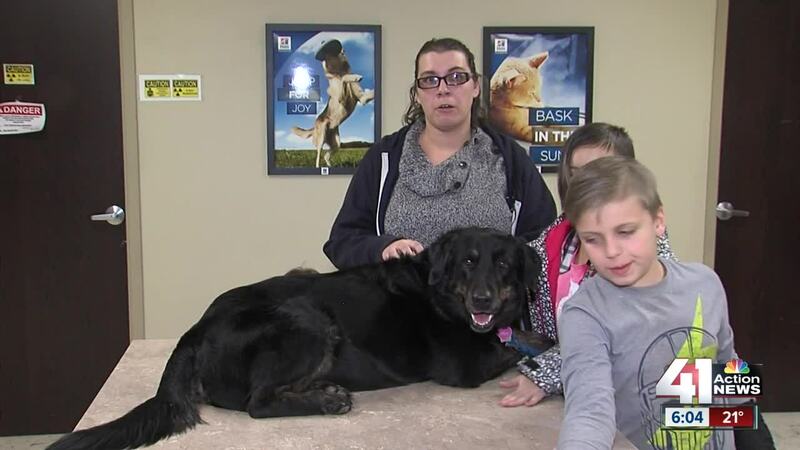 — A tearful reunion happened this week between a lost dog and her owners after she went missing for more than two months. "I was excited, I was on the floor crying," Melissa Oppenheim, the owner said. Oppenheim said on Nov. 26, Kara, a four-and-half-year-old chow lab mix slipped out an open gate while her kids were playing in snow. Since then there's been a number of search parties and sightings of Kara, who's been fighting the odds since she was pup. "We found her in a parking lot, she was in a box with all her brothers and sisters that passed away and she's the only one who made it out of the group," Oppenheim said. Kara overcame several more obstacles in her journey from Lee's Summit to Swope Park. On Wednesday, a KCPD officer spotted Kara in an embankment near East Gregory Blvd and Oldham Rd and called KCMO Animal Control. "He thought maybe it had gotten there when the water had frozen and then the water thawed and the dog stranded," Chris Harriman, a KCMO Animal Control officer said. Harriman said Kara built a nest for shelter among the thick brush in the embankment right next to the rockwall. He believes that she survived on roadkill during her journey. Harriman and his colleague, Animal Control Officer Jamie Gomez, hoisted her in a kennel ten feet to safety. "She was just trying to stay away from me at first but once we got her on the leash she was trying to get close to Chris and warm up, she was pretty cold," Gomez said. Kara's tags led to the reunion with her at the KC Pet Project. Kara's veterinarian, Dr. Angela Holt at the Chipman Road Animal Clinic, said Kara lost more than 20 pounds during her trek. "When she came in we dewormed her because there's no telling what she'd eaten to survive we just kind of covered everything to make sure she'd stay healthy," Dr. Holt said. Safe and sound after an odyssey for this tough dog. "She didn't play today because she's trying to get to the relaxing part in because she's been gone so much," Oppenheim said.